Zion Williamson is averaging 20 points, eight rebounds, two blocks and two steals per contest. No player has done that in at least 25 years. Ten games into what will almost certainly be his lone season in Durham, Duke’s Zion Williamson has treated college basketball like a rim on a breakaway. Which is to say, he has left it trembling. On game days, the anointed freshman effectively has a residency on “SportsCenter,” his highlights the fantasy-come-true of any sports-radio personality or TV show producer. Need to fill time? Just discuss the comical absurdity of an 18-year-old throwing down midgame windmills with ease or opine that he’d be unable to handle the scrutiny if the Cleveland Cavaliers were to select him in the NBA draft. That’s because college basketball has never seen a player like him. With a 6-foot-7, 285-pound frame, Williamson looks more like a linebacker than he does a forward. The Wall Street Journal, with the help of a university physicist, found that attempting to draw a charge on Williamson is akin to colliding head-on with a Jeep. Among all active players in the NBA, only Boban Marjanovic outweighs him. And at 7-foot-3, Marjanovic is more than half a foot taller than Williamson. The build of the former South Carolina Mr. Basketball is certainly unorthodox. At Duke’s practice combine, Williamson’s vertical leap exceeded 40 inches. He corrals rebounds and defends the paint with the unadulterated violence of a center, runs the floor with the fluidity of a modern wing, possesses touch with both hands and has a shooting stroke that stretches to the perimeter. Relative to his size, Williamson’s athleticism doesn’t compute. He’s the Refrigerator Perry of the hardwood. In the one-and-done era of college basketball, Duke is no stranger to dominant freshman — players like Jahlil Okafor, Jabari Parker and Jayson Tatum. But what Williamson is doing in his first year at this level is downright historic for any player, let alone a freshman. One way we can assess a player’s contributions to his team is Box Plus/Minus, a metric that estimates the number of points per 100 possessions a player contributes above (or below) average using stats found in the box score. BPM has never seen a college player like Williamson. Among players who qualified for the points per game leaderboard at Sports-Reference.com and appeared in at least 10 games since 2010, the first year for which data for all players is available, Williamson’s mark of +20.4 ranks first among 25,793 individual seasons. Another way to evaluate a player’s contributions is using player efficiency rating. Williamson’s PER of 41.9 is the best mark by any player who saw action in at least 10 games since 2009, the earliest year for the data. It happens that Williamson is emerging at a moment in which the NBA is putting a premium on positionless players. A decade ago, Williamson might have been relegated to the post, his skill set withering away against taller opponents on the blocks. However, Krzyzewski doesn’t need to shoehorn Williamson in anywhere; ostensibly, he has free reign to roam the backside of the defense like a safety and run the floor in search of rims to pulverize. On one of the nation’s deadliest offenses, Williamson is likely the team’s most versatile player, dropping in a team-best 1.18 points per possession,2 according to data provided by Synergy Sports. 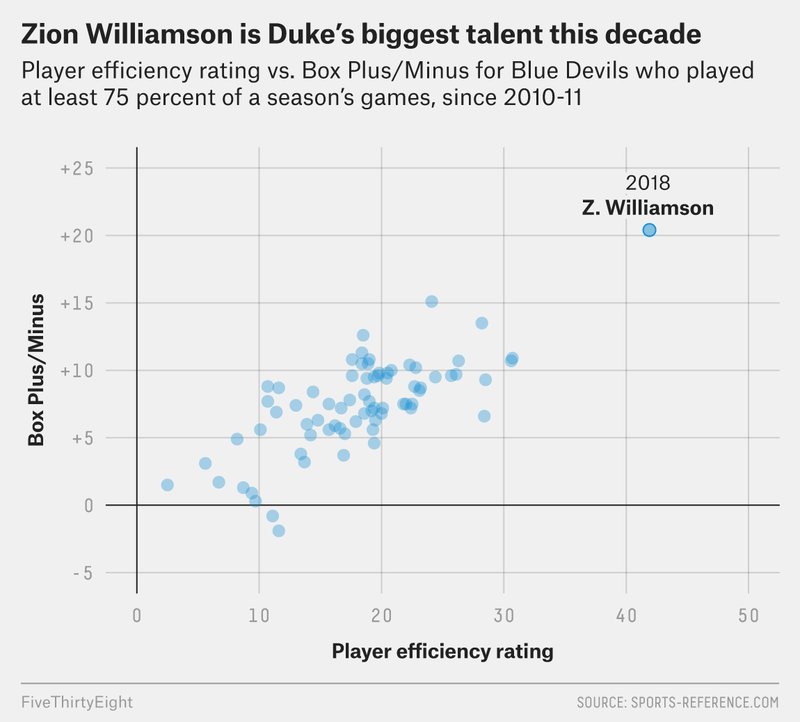 Because of his size and speed, Williamson has been a nightmare to defend in transition, where he contributes a team-best 1.48 points per possession.3 It doesn’t get any easier for the opposition in the half court, where he ranks in the 91st percentile in scoring. Fronting Williamson in isolation is a fool’s errand. He pours in 1.31 points per possession in those situations, good enough to rank in the 95th percentile nationally, with an adjusted field-goal percentage of 70 percent. Factor in his uncanny court vision and passing abilities, and the equation gets scarier. On isolation plays that include passes, Williamson is scoring 1.37 points per possession, which ranks in the 96th percentile. Allow him to find a spot on the interior of the defense, and you’re asking for more problems. Williamson scores a team-best 1.14 points per possession on post-ups, which ranks in the 89th percentile. When the opposing defense doesn’t send an additional defender, Williamson scores a robust 1.44 points per possession, which ranks in the 99th percentile. Williamson is adept at setting a pick in a pick-and-roll set, but he can also run it. On six pick-and-roll possessions as the ball handler, he scored 10 points. Defensively, Williamson is more than serviceable. As the primary defender, he allows 0.72 points per possession, which ranks in the 73rd percentile. Duke’s defense has improved considerably from a year ago, when Krzyzewski was so fed up with the team’s performance that he instituted a zone defense. This season, the Blue Devils are playing a zone base on just 3 percent of minutes and rank in the 97th percentile in points allowed per possession. Some of that certainly is attributable to the switchable Williamson, who averages two blocks and two steals per contest. His numbers already stack up well against the last five players to go No. 1 in the draft — and many draft projections indeed suggest he’ll go first overall. Williamson is averaging 20.4 points and 9.0 rebounds per contest, with a true-shooting percentage of 67.5. Only three other players since 1992 have hit those benchmarks, and each was an upperclassmen. And let’s not forget to factor his defense into the comparisons: No player in the past 25 years has averaged 20 points, eight rebounds, two blocks and two steals per contest. But that’s where Williamson is. At its roots, basketball is a sport largely defined by the exploitation of mismatches. Williamson is a mismatch for virtually every player tasked with defending him, and he’s putting up numbers that haven’t been seen in at least a quarter-century. Williamson garnered a reputation as a high flyer by punishing rims and opponents at the high school level, but his first — and likely only — season at the college level has revealed a more polished game that extends to every area of the court, not just above the rim. Five of Duke’s next six games will be televised by the ESPN network. Among players with at least 10 possessions.